Venus announced the next volume in their The King In Motion Series. 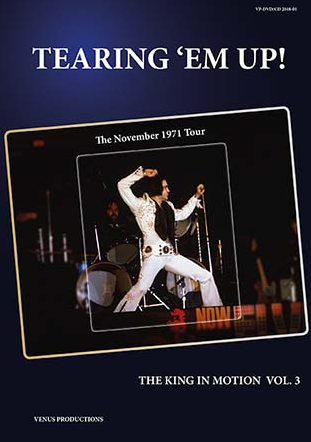 This book/DVD/2CD combi will have the title 'Tearing 'Em Up - The November 1971 Tour'. The DVD has 40 minutes of 8mm video from this tour, synchronized with the sound of the Boston show on November 10, 1971 (Power of Zhazam). The 209 page book will have many unpublished photos from this tour, according to the announcement. The 2CD will have the complete Boston show. Yes, it´s Vol. III, they released " Las(t) Vegas " and " Wahoo ". Vol. III !? Did I miss something or is it a mistake in the advertise !? There appears to be no professional concert film from 1971 and so the good quality November 8mm video footage always fascinates me. It shows Elvis really relaxed, confident and like a tiger let loose from his cage as opposed to a 'slight' reticence in comparison when he knew the film cameras were turning. As an example You've Lost That Lovin' Feeling from Houston is for me, a joy to behold.